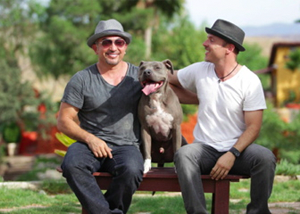 In 2013, Sean was personally hired by Cesar Millan (The “Dog Whisperer”) to teach and train students alongside Cesar for his highly-acclaimed seminar Training Cesar’s Way in Santa Clarita, California. Hi everybody, my name is Sean O’Shea, founder and owner of The Good Dog Training and Rehabilitation. I founded The Good Dog with one goal: Providing dog owners with the help, answers, and results they desperately needed, along with the care, compassion, and understanding they deserve. As someone who started many years ago with two dogs with serious issues, I know firsthand what it’s like to feel frustrated and hopeless. The good news is, there is hope! My team and I have worked tirelessly to devise a program that offers the very best answers and solutions to even the most challenging K9 issues, which has enabled us to regularly perform “miracles” with dogs that other trainers have given up on, or are unwilling to work with. Our mission and our commitment is to create amazingly balanced, well behaved dogs, and happy, highly satisfied owners. So if you are ready to transform your dog, and your life, we are ready to help. *Sean is internationally-recognized as the leading LA dog trainer and dog behavior expert, specializing in aggressive dog training. In 2013, Sean was personally hired by Cesar Millan (The “Dog Whisperer”) to teach and train students alongside Cesar for his highly-acclaimed seminar Training Cesar’s Way in Santa Clarita, California. He’s a regular guest on Jeff Gellman’s widely-heard and highly rated dog training radio show “What Would Jeff Do?”, and authors the popular blog The Good Dog Life Blog. He trains rescue/shelter workers how to more successfully rehab shelter dogs, and travels the U.S. training other dog trainers who are eager to learn his unique approach, techniques, and philosophy, through his and Jeff Gellman’s Train The Trainers program. Sean is a proud member of The International Association Of Canine Professionals. The Good Dog Training and Rehabilitation, founded by internationally renowned dog trainer Sean O’Shea, is the premier Los Angeles dog training and rehabilitation service. The Good Dog is often the last stop for dog owners who have exhausted every other option and have still not found the help or results they need. Our unique and highly-effective training approach consistently delivers results that surpass our clients’ expectations, creating the kind of happy and harmonious relationship that every dog owner dreams of. From the simplest behavior problem to the most severe aggression, we have yet to find a dog we could not help. We sincerely believe, and our results have consistently proven, that the dog you have today does not have to be the dog you have tomorrow.